If, in 2013, I’d told you that the average South African Super Rugby side would – by going all out over the next four years to produce an attacking brand of rugby – score an extra 10 tries per season, win 3 percent more games and accrue six more log points at the cost of conceding nine more tries and failing to clinch any titles, would you have given the project the go-ahead? For all the negative publicity that the Bulls got for winning three titles by unfashionable means, they remain South Africa’s only Super Rugby champions. That’s right, the fireworks of the Spectacular Attacking Show that our franchises dazzled fans with between 2014 and 2017 produced this many Super Rugby trophies: zero. 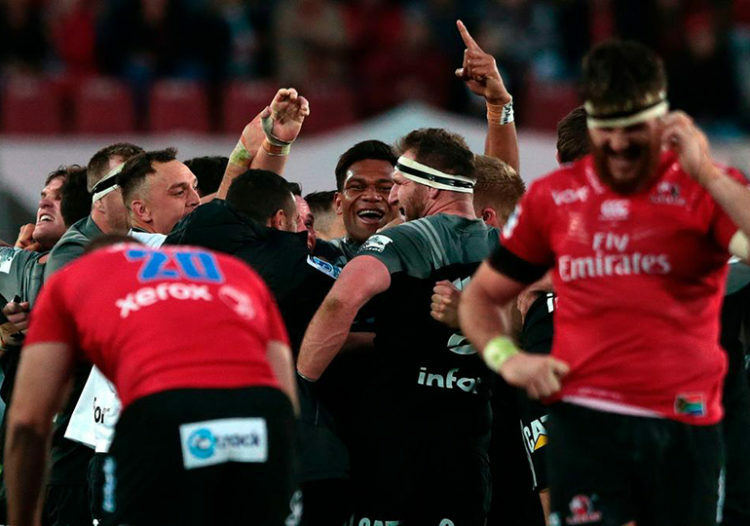 Those four seasons are relevant because they begin with the return of the Lions from the sob-story wilderness of Super Rugby exile, and track SA’s Super fortunes through all of the completed seasons since. Combined, those teams won 166 of 340 matches with eight draws (49% win-rate). They scored 8597 points while conceding 8748, and dotted down 944 tries while allowing 1007 en route to a tally of 797 log points. During the time the ‘boring Bulls’ won three titles, SA’s franchises combined for 120 wins in 260 matches with 5 draws (46% win rate), 5803 points scored, 6263 conceded, 639 tries, 719 allowed and 597 log points. At face value, these totals suggest the attacking renaissance was overwhelmingly positive, with a big jump in points and tries scored, and log points. But a comparison of the totals doesn’t work because the format of Super Rugby changed, again, in 2016. The averages of the SA teams from each of those four-year periods offer a much clearer indication of the cost of Project Attack. On average, between 2014 and 2017, attack-minded SA teams won eight of 16 matches in a season (rounded up), scored 388 points and conceded 397, crossed for 42 tries and gave up 45, and logged 36 points on the standings. Between 2007 and 2010, conservative SA teams won six of 13 matches per season, scored 290 points while giving up 313, dotted down 32 times and allowed 36 tries for an average of 30 log points per team. Admittedly, there has been a net gain in the numbers, but at what material benefit? If professional rugby is about winning titles, and South Africa’s pursuit of a new style has produced none, has it been a success? Some will point to the fact that the Lions have contested successive finals as evidence of the merits of the seachange in approach. But one Sharks semi-final, together with the Lions’ two semi-finals and two finals, account for all of SA’s final-four appearances during a period of guaranteed places in the playoffs. There was no such guarantee between 2007 and 2010, and SA teams contested four semi-finals and two finals, including two all-SA finals (2007 and 2010). And the folly of the attack-frenzy becomes even clearer when you compare the Boks’ fortunes across the two periods, with the first highlighted by a Tri-Nations title and series-victory against the British & Irish Lions and the latter blighted by record defeats. With two rounds to go in the league phase of the 2018 season, the Lions are the only SA team currently among the eight playoff contenders. If attacking rugby produces more tries, and tries win matches, why hasn’t a South African team won a trophy during this period of “positive rugby”? The simple answer is because New Zealand and their Super Rugby teams play better “positive rugby” then ours. This was the biggest waste of time, I have ever read. If domkrag was so amazing, then why did it stop working? Suddenly their game plan is useless? How many finals have domkrag reached since the game of rugby evolved after 2010? Zelim the answer is pretty simple really and it surprising that a journalist of your ‘calibre never picked up on it ? The simple answer is – THE RULES CHANGED ( and I apologize to you for having to stress my point with capital letters ). It goes further than that though. Dom krag rugby up to 2009 in test rugby and 2010 in the case of SR is the last time we have won an international competition. In fact if the Bulls were so dominant with their conservative game plan after that why didn’t they continu to show progress ?? They in fact have been the biggest losers since 2010 with this year even more pathetic. Why is Mitchell battling to get the Bulls up to par ? The players are steeped in dom krag rugby and the demands of the expansive game is just too much for them to absorb consistently imo. Another point. In 2009 after the Boks thumped the AB’s 3-0 ( under my personal favourite – Pieter de Villiers ) the AB’s went back to the drawing board and with the help of rule changes which rewarded attacking rugby they went on a world top ranking rampage for the next nine years. Coaching challenged Heyneke Meyer followed by his dom krag pal Alistair Coetzee could not adapt and the rest is history. The Boks have lost to the AB’s in every game since 2010 until their solitary victory in 2014 when the Boks butchered a 16 point lead to be behind on the scoreboard with two minutes to go. It was then that the infamous ‘tv producer’ manipulated the rules to gift the Boks and poor Heyneke a face saving win. His ONLY one. So it seems that all the Franchises except for the Lion decided that there was no need to change with the net result that those Franchises did not win anything in SR for the next 8 years. Again let me reiterate if dom krag was the game of choice why was it not successful ? The Lions conversely decided there is only one way to go and picked up the refugees from the other Franchises who could find no place in the conservative no risk rugby of those Franchises and welded them into a formidable unit. What rugby did the Lions play ? Non conservative rugby. In the meantime Ludeke Gold, Coetzee, Meyer and more recently Fleck and Du Preez kept their blinkers firmly on and were incapable of changing their outdated game plan. Coaching expansive rugby is far more demanding than the ‘stampkar’ stuff believe me. Rugby nous is needed in large quantities and these Franchises lacked the vision. And this is where you need to answer some questions Mr Nel. 1. You used the lack of success of the Lions in winning SR but if conservative rugby was so successful then why did the other Franchises who played what you seem to consider being a ‘trophy winning’ game plan, not get to these SR finals ? 2. Between 2015 and 2017 the Lions played the AB teams 14 times winning 7 and losing 7. The seven wins includes FIVE play off games where the Lions accounted for NZ’s best. Sure they dropped the first final in torrential rain and gale force winds and a rampant Barrett ( and who wins in NZ anyway ) but in the second final the Kwagga red card was the only reason they eventually lost. Why then do you want to denigrate their efforts ? 3. Imagine where our place in SR would have been if we didn’t have ONE team to carry the torch ? NZ already treats us with utter disdain and the Lions were probably the only reason they didn’t deride us even more than they derided the Aussies these past few years. If the Lions were wrong in their approach what was your alternative ?? And my final point. You asked why attacking rugby has not produced the goods. Well I have answered that in part above but consider this as well. Apart from the Lions the other teams have tried it in one form or the other with absolutely no success. So dom krag was unsuccessful and attacking rugby for them was unsuccessful. So now you pick on the one team that has at least brought something to the party and criticize what they have attempted to do. Rather offside don’t you think ? You clearly have a preference for the dom krag stuff despite it’s failure since 2009 so the Lions are fair game. Very shortsighted my friend. I note you waited for the Lions first loss to a local Franchise to come up with this frontal attack which does nothing for your sense of objectivity which is the hallmark of a top class journalist. May I ask you to kindly respond to my post point by point or are you going to keep your blinkers on ? Cheers. Herman, I agree on parts of your argument here. This is a terribly written article but an equally poorly written comment. Rugby isn’t as black and white as described in both arguments. The All Blacks do not win so often because they play only attacking rugby. Rugby is about balance, and that is where ALL of our teams are failing at the moment. Now, don’t get me wrong, the Lions are the closest to that “total rugby” goal we so desperately seek. But they lack where it counts, BMT. Sure they won some quarter and semi-finals with the chips down…at home…on the highveld….after their opposition traveled halfway across the world. And I do applaud them for that. But they didn’t have the maturity and composure to win the big ones. The red card may have been unlucky, but who’s to say they would have definitely won? We will never know, move on. Furthermore, using avoidance tactics to argue a poorly written article is poor. The facts are, NO South African side has won for a very long time. Rugby has moved on and total rugby with BMT is required. You can’t summarise it as “dom krag” (i really hate that phrase, can’t we use another term) versus attacking/width rugby is just as ignorant as anything written above. Rant, thanks for that but your ‘poorly written’ and ‘avoidance tactics’ comments need clarification. Please oblige. Furthermore you say the NZ teams play balanced rugby but don’t the Lions ?? How can you get to two SR finals and being 2nd and 1st on the overall SR logs if you don’t play balanced rugby and have no BMT. ?? Is the only team with BMT the team that wins a competition ? We all know the vagaries of rugby with the complicated rules, poor refs and other officials continually getting decisions wrong. If the Lions had won in 2017 and I still say they would have, would your comment have had any validity ?. In some matches this season alone look how the negative effects of an early red card has affected the results. Even a yellow card is a game changer in some cases. Methinks you didn’t put much thought into this before rattling the keyboard. As for ‘dom krag’ well regrettably it’s here to stay until it is finally abandoned as a first option by most of our teams. Their current SR standings suffices to prove my point. Thanks for the ‘Peace and Respect’ close but accusing someone of a poorly written comment ( twice ) as well being ignorant is hardly conducive to a ‘bridge building’ environment. I thought we had agreed not to get personal ? Don’t worry old chap I forgive you and wish you nothing but a clear head and objectivity in future exchanges. Cheers. Thanks for the comment, Herman. I noted the Lions have come the closest of all SA teams. The simple fact is the Lions still fail at crucial times. Losing to Jaguares when traveling, unable to beat the Kiwis in NZ. Those are the small margins they still struggle at. Sure they do well on the highveld. But they just can’t get over that final hurdle to actually win it. I do not dislike the Lions, in fact, I really enjoy watching them play and really hope they do win it. My issue is with fans who are so eager to jump on the bandwagon their objectivity goes jumping out the window. The Jaguares are a prime example of how good coaching (and keeping the international team together) can improve one’s fortunes. They won all games on the road in Australasia. You mentioned how teams don’t beat NZ in NZ. But that is the exact reason I say the Lions haven’t perfected it yet. Yes, I concur they are the best in SA. But champions they are not. They still lack that killer instinct in the big moments. I think, under their current form, the Jaguares might be a dark horse to win the SR this year. They know they can beat any team, and do so while traveling. Might be worth a cheeky bet even. Oh, and I did clarify my ‘poorly written’ comment. See the second and third sentences of my first comment. It was not meant to be personal but merely stating that perhaps you let your emotions get the better of yourself. Ditto the ‘ignorant’ statement. I most certainly used the incorrect adjectives to get my point across, so I do apologize. I find your final sentence quite amusing, it certainly made me chortle. All the best Herman here’s to our next ‘debate’. Rant, thanks for that so let’s call it even. But I still believe the ‘red card’ did cost us that game which had nothing to do with the supposed lack of BMT of the LIons throughout the season, Jackass Peyper’s knee jerk reaction saw to that. No wonder the kiwi’s love him. Cheers. as long winded as usual…..the reason Hermie , as you will find out pretty soon, why the ‘conservative’ franchise/s did not return to the top again is a matter of quality players leaving for Europe, among other things. It indeed will be interesting going forward to see just how well your pet team will fare once their top players have ALL left for greener pastures. Sometimes a team from west of the great divide (Drakensberg) actually did not deserve to qualify for a final as in last year the team from the coast being denied victory by a penalty after the hooter. Of course you’d point to great teams manufacture a win while losing…..just like last Saturday when the Sharks soaked up all the running from the Lions, tackled them into a standstill, upped the ante in the scrums later in the game and dare I say…had the audacity or the nerve to pull off the win playing percentage tactical rugby. Great teams do manufacture the win! That’s one win out of 8 games in four years against the Lions ( your poor run started in 2014, lol ) So I guess as our Afrikaaner brothers would say – ‘n blinde hoender pik ook raak’ . Good luck to you guys but if you keep old Du Preez as your coach next year be prepared for the same roller coaster ride as before. By the way Rant ( above here ) asked me to drop the ‘dom krag’ expression but if I think about it the Sharks played typical dom krag rugby on Saturday and won. The problem is it may only happen once every ten games ( ask the Boks ) and that doesn’t get you anywhere closer to winning anything I’m afraid. I think your past few seasons prove my point. So embrace the new expansive game and be rewarded the proper way and not use the odd ‘dom krag’ win to try and prove a point. Rugby is about consistency my friend and that’s where the Sharkies need to improve but please try and do it by playing ‘real’ rugby. I agree however that the Lions will need to rebuild and it may impact on their results in the short term but they will stick to their tried and tested game plan no matter what the misguided Zelim Nel and others may think. If it ain’t broke don’t fix it. Cheers. and next year it will be every game…..the lions will be cut to size and the balance restored…..egos deflated…..’domkrag’ what a pitiful expression that has been hijacked by you, once the go-to expression for an equally pitiful individual (known by many names) who maligned all thing rugby RSA…. Greg I’ve been using it for 5 years on these forums long before our friend of many guises came on the scene, so the inference is unwarranted. I brought it back after our rugby started to unwind since 2010. It’s also a simplified way of describing the many negative aspects of conservative rugby as is the use of ‘expansive’ to describe a balanced multifaceted positive form of rugby. I also believe both you and I have the right to express ourselves as we see fit so go for it. Cheers. PS : This year still has to play itself out for the Lions so hold your horses and next year will sort itself out Nostradamus. Cheers again. Dom krag vs expansive…is that all you see? Total Rugby is what NZ do best. They have plans A to Z but you summarize it as expansive. Playing only expansively will get you to finals but they won’t win them. Play the conditions best and you will win. The Lions have come close but sadly losing Ackermann halted that progression. Rant, see my reply to Greg above for my clarification on ‘expansive. By the way where was the ‘total’ rugby by NZ teams and BMT when we won five playoff games against them over the past two years ? Cheers. Hey Zelim, you raised a very good point. But I believe that a scintillating Attack and a strong Defence aren’t mutually exclusive. Having a strong attacking game doesn’t mean that you need to have a weak defence. In order to win a game, you have to be able to score tries while stopping the opponent from scoring. We’re currently getting the scoring tries part right and now we just need to get the defence right. The reason it hasn’t come right yet, in my opinion, is that the players don’t work hard enough and are a bit too lazy. Most SA teams have extreme intensity on attack, but on defence the fatigue that the attack caused leads to tired defending.The reason why Pieter-Steph du Toit and Mostert are such assets is because they are constantly focused and ready to make tackles. We need more of these players to keep up with our faster game. Ultimately I think the problem comes down to the players’ and even the coaches’ mentality. After 20 years of domkrag and slow rugby, we can’t expect the faster game to click after only 3 years or so. Not to mention l, seeing many tries draws crowds, which every journalist seems to be doomsayers for. Anyway, I think that enterprising attack is the way forward. Thanks for the article, it makes a very good point. Conor you are quite correct with your reasoning although I disagree, Nel’s article did not make a very good point. It was promoting a conservative game plan where he and a few of our coaches seem to be most comfortable. The demands of expansive rugby are much greater than simple Plan A conservative rubbish and players are needed to have the skills, vision and rugby nous to carry it out. The two most influential players in the two England tests we won were Faf and Willie and they are not even part of SR. But for them I don’t believe we would have come back from that position with Pollard and Co. Rassie admitted what they did was not the game plan, it was in fact ‘dom krag’ imo. Balanced expansive rugby as your Plan A is an imperative going forward and the jury is still out on Rassie as to which plan he will adopt. Cheers. Let’s all just give up. Stuff the ball up our jumpers, Kick everything up into the blue African sky and pick the biggest fatties we have and put them on a Sumo wrestling Course. Nick, good one. I have responded to Mr Nel above. Cheers. I believe we have always been compromised with the format where the travel factor is skewed. Add to that we have the Rand exchange rate. The Bulls that won this thing were an exceptional side. Conor makes a good point. But I cannot help but think the issue of appropriate conditioning is important. To prepare for a slower power game, as opposed to a quicker, lung busting one, it follows that training and selection are applied to either style. In simple terms, one would emphasise power work over stamina work for eg. Obviously it goes much further and is more complex than this. Professional athletes train very specifically. The Bulls for eg seem to have incurred a number of injuries and/or player burnout. Inevitable maybe. A number of commentators have remarked on the better levels of conditioning within the Bulls. Once they get through this season they will start the next in far better shape. True, deep fitness takes time.Not only will they be more suitably conditioned, but players and coaches should also be more proficient re skills and understanding of what they are doing. [We hope.] It follows they should be better at a pacey more airobic game if they continue to train in this manner, because they will be fit and skilled enough to achieve the standards we would like to see. When we look at some of the issues that were discussed at the rugby indaba last year, a big emphasis was placed on conditioning. I do not believe that a Common Strategy or pattern was discussed. That would be unworkable. But a Common understanding and application of what language and terms of standards of conditioning for all feeder teams to the Boks was established. I believe we are on the way in this regard and will improve because of it. Just shocked that it seems to have taken about 25 years. And let’s not think these Indaba’s were toeti froeti’s idea. Dr Venter initiated them. The demise of SA rugby isn’t because they have focused more on attacking rugby than their traditional playing style. It’s got to do with the influx of top quality players and coaches going overseas. The first and second-tier players have left to Europe and Japan. You even see some playing for Australian and New Zealand Super rugby franchises. Think about Dave Wessels, Owen Mounemaine and all the young coaches who have left. We have lost a massive amount of intellectual property and SA rugby don’t seem phased at all. Compare the amount of Springboks and seasoned veterans in those teams of 2009 and 2010 (Bulls and Stormers especially) to the players we have now. The Lions are feeling it this year and next year will be even tougher due to the player and coach drain. They’ve lost Ackermann and Ferreira, two top coaches. Now they are in line to lose half of the starting team that got them to those two finals. Experience is massive in rugby and every time players leave their is a huge gap between the incumbent and the guy who comes into the team. Until SA rugby find a way to keep our best players and coaches in SA, it will continue to hinder us. The horses for courses mentality is not working anymore. It’s time for SA rugby to focus on keeping the best 250-300 players and top coaches in South Africa. If you going to allow players to leave, then have a plan in place to have them return. Loan your top players out to European clubs for a season or two. They would bring back that experience of different conditions and environment to SA rugby. The Pound is sitting on 18 and the Euro 16. If I had little or no chance of playing for the Boks I would be looking for overseas opportunities. Even if there were a good chance of playing for the Boks I would be looking. It’s a no brainer! As you rightly say the only way is to reduce the number of contracted players and pay them more. This creates another set of problems. Many of the pundits including guys like Mallett have been saying this for a very long time. The suggestion has fallen on deaf ears because a lot of suits would be out of a job. The football model is the only way to go. French and English club teams have begun to adopt it. You have private ownership and a billionaire pumps money into the clubs. Is it the only sustainable way forward? Mind you, those clubs are also in massive debt but I think it’s more to do with their insane salaries for players and coaches (without any salary cap). We need private ownership. The unions in SA rugby have failed the supporters for far too long. 3. Despite playing defensive gameplans, old school teams still had a strong focus on basics. For example, their set piece and defense were execellent. Also made less handling errors. I would be interested to see the average tries per game of the bulls in 2009. Remember they won the final by 60 points, that doesnt sound like boring rugby..
Rules change, tactics change, teams adapt better than others. We are talking 10 to 12 years of difference here where 6months can be one hell of a long time in rugby. Got a feeling Zelim just wants to defend his domkrag stances. Perhaps he himself cannot adapt with the times as a rugby journo. This article is a great insight into the problem that Rugby faces in South Africa. They are so stuck in the 90s. Adapting and evolving are questioned even when the old ways took them to the bottom of the rankings. Absolutely agree Shane. Many still think this way as stated in the article, many also at the top echelons of coaching in SA. This also feeds in this nostalgia to many of the “before times”, where they praise the burly boys of old, then lament about players like CJ Stander leaving for Ireland, citing reason like “quotas”, AND THEN at the same time writing off smaller adaptable players like Kwagga and Whiteley, the same reason CJ actually left in the first place (being too small then, playing in the times of Ludeke and Meyer at the helm of the Boks and Bulls). Domkrag is dead! Get with it SA!